When you think of a flying contraption with multiple rotors your mind probably conjures up the image of a new-fangled drone - well, what if someone took one of those designs and created a vehicle big enough and powerful enough to support a manned flight? 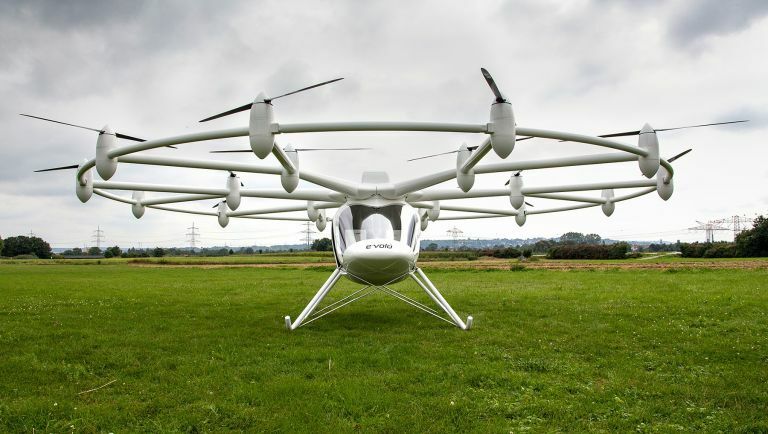 E-Volo has done just that with its latest creation, the Volocopter VC200. The German firm has actually been working on a viable, multi-rotor design for years (it successfully completed a remote test flight in 2013) and it's now finally in a stage to show off a working prototype. Its first manned test flight was just completed over in Germany, and while it wasn't the biggest flight in the world it certainly takes the company closer to getting the Volocopter into the commercial sector. So what makes the Volocopter such an intriguing prospect? Its 18-rotor design makes it extremely stable in the air, which also helps protect the user against technical failures thanks to the large number of blades proving lift. It runs on rechargeable batteries, making it clean and environmentally friendly and, like any helicopter, it doesn't need an airstrip to help it land. At this stage, the Volocopter VC200 isn't ready for public flights quite yet (the recent test was the first of many and the single seat capacity isn't large enough yet to make it a viable taxi service), but E-Volo is certainly confident its new design is finally on the road to success.